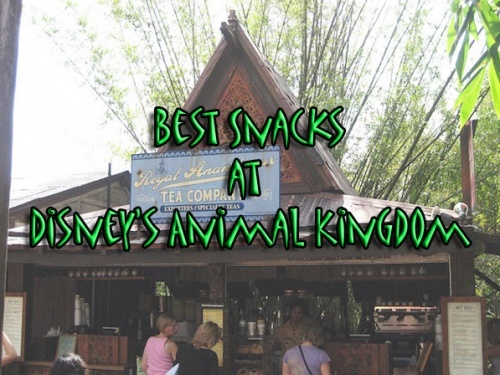 One of the most popular restaurants at the Walt Disney World Resort is Whispering Canyon Cafe. This restaurant, which is a table service location at Disney’s Wilderness Lodge is known for a couple of things… all you care to eat skillets, bottomless milkshakes, and fun shenanigans! (The most popular is the request for ketchup!) However, with all that said, about a month ago, the internet lost its mind as the rumors were swirling that the restaurant would be removing its shenanigans. People immediately got into a frenzy! I wanted to take matters into my own hands, so I did two things. First, I tweeted to the @WDWToday account (which is Walt Disney World’s official Twitter account and was told that the restaurant was still a “rootin’ tootin’ good time” and that “plenty of antics” would still be occurring. The only difference would be that volume would be turned down a bit “to be more considerate to all Guests at Disney’s Wilderness Lodge.” This answer made sense to me. 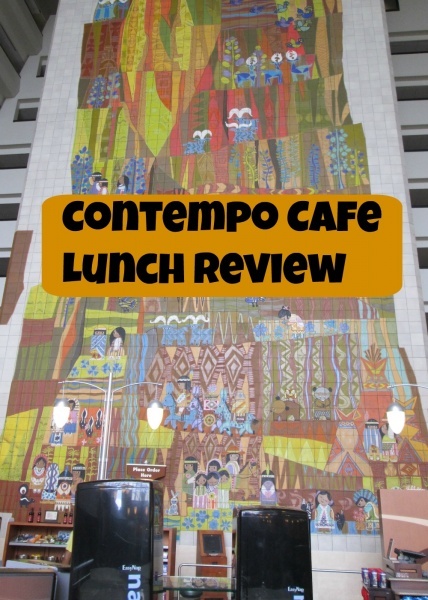 If you’ve ever been in the lobby, you’ve heard the yelling for ketchup echo from the open restaurant through the cavernous lobby, and for those staying in that section of the resort, it’s quite a wake up call at 7:00 a.m. when you start hearing yelling from the restaurant below. But, I wasn’t content with just a message from Disney’s Twitter account. I had a vacation scheduled and I promptly made a reservation to experience the restaurant with my own two eyes and ears. I made a reservation for breakfast, because while I’d visited multiple times for dinner, I’d never actually experienced breakfast here. So, after checking in and waiting in the resort’s lobby, I could hear that it was definitely a bit quieter. My curiosity was peaked. How were things actually working here….had they really removed the fun? As soon as we were seated, I quickly learned that the shenanigans were still in place. Immediately, the table next to us requested ketchup. Ok, I thought…let’s see how this goes. The main difference was that instead of the Cast Member yelling for the ketchup, it was now on the Guests to make the request. 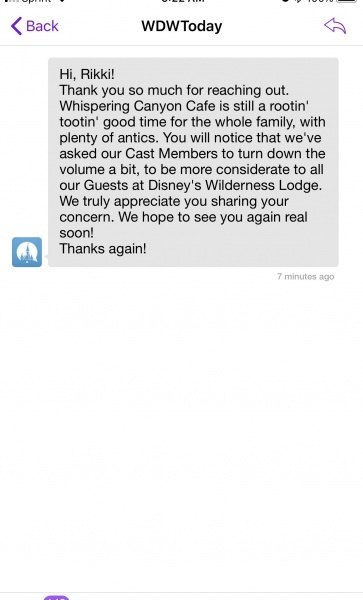 (And typically the Guest yelled at a much lower decibel than the Cast Members previously had, therefore immediately cutting down on the noise pollution that the restaurant was clearly trying to remove. The other tables immediately brought over their ketchup bottles and the request continued throughout the course of our meal. The shenanigans continue at Whispering Canyon Cafe! Now, I know a while back, the restaurant had the coasters, where the red side meant you weren’t interested in playing along, but the green side meant you were ok with the fun. Those did appear to be removed, as I did not see them on my table. So, as far as things go with the shenanigans and good times, they are still plentiful at Whispering Canyon Cafe! But what about the meal itself? I mentioned the skillet and for breakfast they have a bountiful one! It comes with Scrambled Eggs, Country Potatoes, Hickory-smoked Bacon, Sausage, Mickey Waffles, House-made Buttermilk-Cheddar Biscuits, and Sausage Gravy! Oh and did I mention it’s all you care to enjoy? Both my husband and I got the skillet, so they brought out enough for the two of us, however if we wanted more of anything, all we had to do was ask. The scrambled eggs were good; they seemed like actual eggs – not the powdered kind. The bacon was fantastic, as all bacon is. The potatoes had good flavor with peppers mixed in to give them a little more flavor. The buttermilk-cheddar biscuits were delicious! They weren’t quite like Red Lobster’s, but they were definitely yummy and mixed well with the gravy. 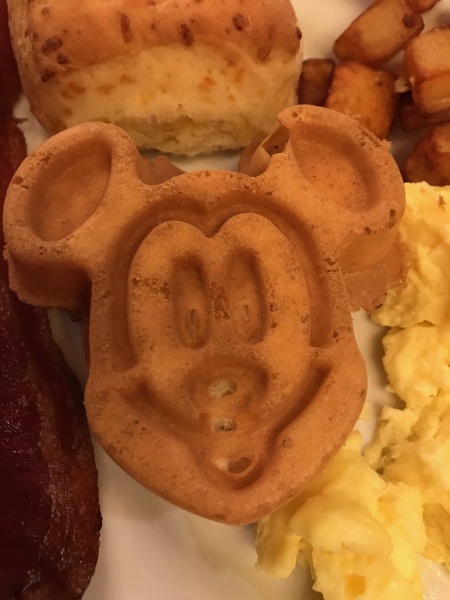 The stand out though…the Mickey Waffles. Now, I’m going to let you in on a little secret. I traditionally think that Mickey Waffles are overrated. Almost every one I’ve ever had has been over-cooked and kind of hard. That was until I dined at Whispering Canyon Cafe. These were the best Mickey Waffles and now I understand the hype. They were soft and malty and incredible. I liked them so much, I actually asked for more! So, if you are looking for a unique meal Whispering Canyon Cafe is the place to go. 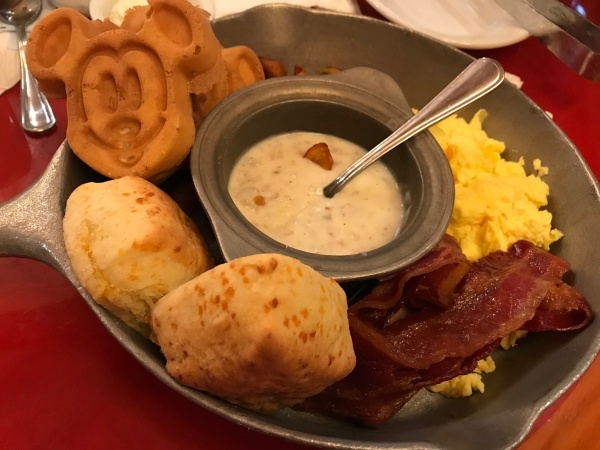 If you’re looking for a great breakfast, Whispering Canyon Cafe is the place to go. 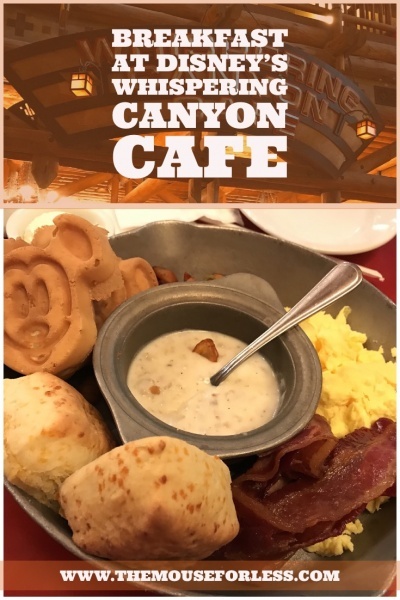 I’m happy to add another breakfast restaurant to my rotation and strongly suggest you make the trip over to this resort, if you’re not staying here, to enjoy the rootin’ tootin’ delicious fun! 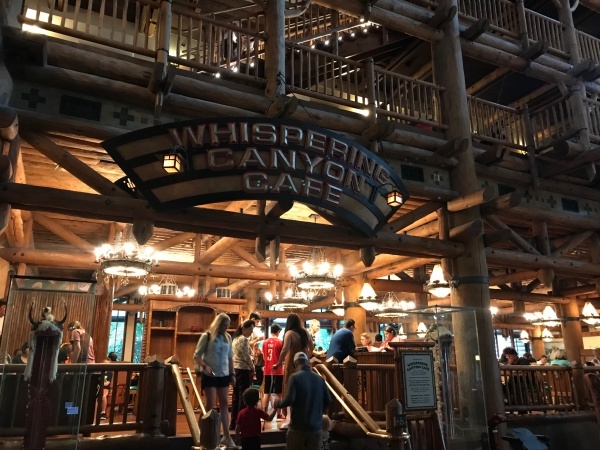 Have you dined at Whispering Canyon Cafe? What did you think? Share in the comments, or on Facebook or Twitter.